August 18th, 2006. A date that may be marked in history books as a cultural milestone, as the defining moment of this summer...nay, year; perhaps even of this century. Nothing will be the same following this date. I'm speaking of course, of the release of Snakes on a Plane. This most unlikeliest of summer blockbusters is something resembling an almost perfect marketing creation; a fad born out of whole cloth, with a rabid army of willing, unpaid viral marketers. It started with the title; a reductive, almost Zen koan of a phrase that is all-purpose plot and tagline all in one. What's it called? Snakes on a Plane. What's it about? Snakes on a Plane. Why do I want to see it? Snakes on a Plane. 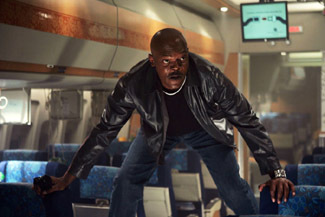 The film started to gain attention when its star, Samuel L. Jackson, raised a public fuss over New Line's attempt to change the title to the less revealing, but altogether unremarkable, Pacific Air Flight 121. It was clear at this point that New Line did not know what they had. From this point, the Internet took over, seizing on the pure ridiculousness of the title and plot. Parodies sprung up, with mock trailers and fake dialogue invented for them. In a stunning post-modern twist, the film went back for reshoots, based on these suggestions. It may be the first film created with input from its fans without even seeing a frame of it. This meta-marketing continued through this spring and this summer, with media coverage investigating this little cult following doing even more work for the campaign, and turning it into something akin to Where's the Beef? : The Movie. The movie itself is almost immaterial at this point, though it's clear that this is a designed cheese-fest, a thoroughly unpretentious summer B flick, with Samuel L. Jackson doing Samuel L. Jackson things, like yelling, swearing and shooting things. It may be the lightning in a bottle at the end of a summer that was largely filled with disappointments. At this point, it's looking to capture a lot of the audience of films like Austin Powers and Scary Movie, and maybe a little bit more. Demand has peaked to the point that Thursday night screenings have been added. The most brilliantly marketed movie of 2006, Snakes on a Plane should easily win the weekend, opening up to a total of $44 million. One could be forgiven for not realizing that there are two other new releases this weekend, which may or may not get lost in the shuffle. The most promising of the two is Accepted, a college-level comedy staring Justin Long, of Ed and Dodgeball fame, and with a shoestring tie to the American Pie series (it shares one producer). Long stars as a college reject who decides to start his own college with classes like Babe Watching and The Decline and Fall of Chevy Chase (okay, that's funny). Sardonic Animal House-style shenanigans ensue. It's aimed at a little younger audience than Old School, which it also maps closely to, but lacks that film's knockout gags, at least in the advertising. It's also getting hammered in reviews, as much as that counts for this film. Long hasn't proven to be much of a draw on his own yet, though this style of comedy is probably his best bet, aiming for a Matthew Broderick kind of every-doof appeal. The winning gambit by Universal, however, is the "ask me about my wiener" dude. He could become a breakout star, and then enter his own little private hell. Opening at about 2,900 venues, Accepted should open to around $10 million. Material Girls stars the Duff sisters, Hilary and Haylie, in a movie that I'm sure was patched together by a publicist. The two star as heiress sisters who, through a series of misfortunes and scandals, lose their place in a cosmetics dynasty. Rather than just give in, they decide to fight for their legacy and what they believe is right, all in a really peppy way. Hilary Duff's star has definitely fallen from her peak Lizzie McGuire days. Outside the Cheaper by the Dozen films, which she wasn't strictly the draw for, her last film, The Perfect Man, was an unqualified flop. Haylie has never had the presence or public awareness her sister's had, aside from her small role in Napoleon Dynamite. This well looks sucked dry, and a lot of its audience will be trying to catch up with Step Up from last weekend. Released on just 1,509 screens, Material Girls should open to about $4 million.